Have the Columbus Blue Jackets turned the corner? 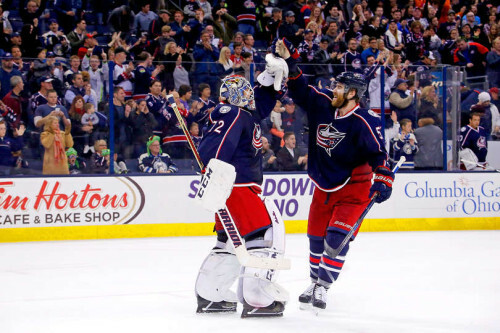 Home/NHL East/Columbus Blue Jackets/Have the Columbus Blue Jackets turned the corner? Going into this past weekend, there was a lot of cause for concern when it comes to the Columbus Blue Jackets. They had 4 wins in 16 games and were headed for back to back games on Friday and Saturday against the Pittsburgh Penguins and Arizona Coyotes. After the weekend – still plenty of concerns but there is finally some signs that the nightmare start could be behind them. The Blue Jackets won both games this weekend and there are some impressive things to consider. For starters, they beat two teams that currently sit in the playoffs. They outscored those teams a combined 7-3. Sergei Bobrovsky stopped 55 of 58 shots and recorded the win on back to back evenings. Columbus was just 57.7 seconds away from shutting out the high powered offence of Pittsburgh until Patric Hornqvist potted one. The power play keeps clicking go 3/7 over the weekend while the penalty kill was successful a whopping 11 times. The three big question marks I highlighted last weekend, Sergei Bobrovsky, Ryan Johansen and Special teams were strengths this weekend. Bob posted a .948 SV% and two wins (and even a secondary assist on Brandon Saad’s goal against Arizona), Johansen racked up a goal and an assist against Arizona and the Special Teams dominated in both contests. They are far from out the woods. They are currently tied with the Edmonton Oilers at the very bottom of the league. A lot of work needs to be done to crawl back into playoff contention. It’s not going to take a lengthy winning streak, (although that would certainly help), it’s going to take minimizing back to back losses. So far players seem to be responding to John Tortorella and his addition has seemingly stopped the bleeding. Can the Blue Jackets dig themselves all the way out of this hole? This week should be a great test with four games against tough opponents. Tuesday the St. Louis Blues are visiting Columbus, before a trip to Ottawa to play the Senators on Thursday. Finally, a weekend home stand against two tough Western Conference opponents starts Friday against the Nashville Predators and finishes Sunday against the San Jose Sharks. Follower of all sports, in particular hockey. Die hard fan of all my teams; Maple Leafs, Blue Jays, Raptors, Eagles and Wolverines! Avid supporter of the up and coming Columbus Blue Jackets. I studied Sport Management at Brock University and completed the Sport and Event Marketing program at George Brown College.